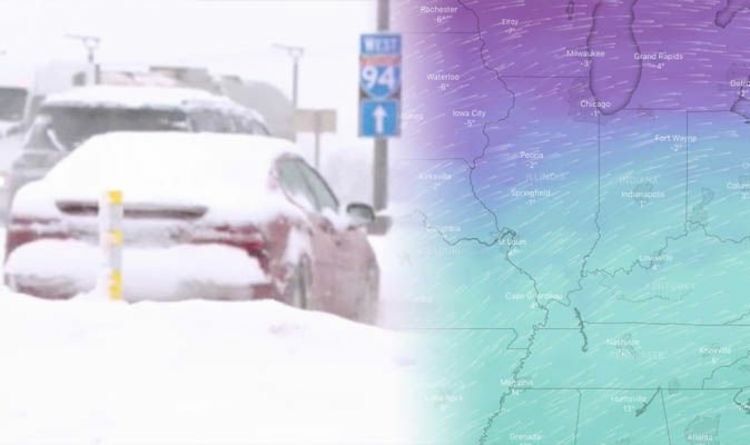 Not long after parts of the USA was bombarded with severe winter storms, another low-pressure system is threatening to bring heavy snow and gale-force winds to midwestern parts of the nation. The large storm will threaten daily routines by disrupting and delaying travel as the powerful weather arrives. The storm will unleash huge amounts of snow and as much as six to 12 inches is forecast in some areas. Where will the snow hit in the USA this week? However, the highest snowfall totals are expected on the upper Mississippi Valley from late on Monday, February 11 to Tuesday night. This area is expected to get the worst travel conditions and people are urged to take care. Heavy snow will also fall across Iowa and into southern and eastern Minnesota and central Wisconsin. The wintry weather will then spread into northern Wisconsin and the Upper Peninsula on Tuesday night. Snow is forecast to transition to an icy mix in this corridor from Monday night. School closure are also likely this week and stretches of interstates 29, 35, 80, 90 and 94 are expected to be difficult and dangerous to travel on during the height of the storm. In addition to slippery roadways, blowing and drifting snow can create blizzard-like conditions as winds strengthen around the storm. Meanwhile, the Weather Channel has forecast more snow to the Northwest, including Seattle, early this week. The weather service has named the weather system Winter Storm Nadia, which will approach the West Coast on Monday, bringing more snow to the Pacific Northwest before spreading toward California, the Intermountain West, Midwest and East with snow and rain later in the week. Several feet of additional snow will bury the Sierra Nevada, particularly above 7,000 feet in elevation, from late on Tuesday through Thursday. The snow and strong winds could cause tree damage and power outages. California's lower elevations could see one to three inches of rain late Tuesday through Thursday, according to The Weather Channel. Foothill locations may also see higher totals of snow over three inches and rivers and streams are likely to rise in parts of California from the combination of rain and melting snow. Snow and rain from Nadia will spread through the Midwest and East later in the week.